Many factors lead to wrinkles, and as we age our bodies struggle to cope with the necessary upkeep required to keep those factors at bay. The skin fails to realign itself at the same rate as before, because the natural regeneration process slows down. Living in dry climates or high elevations can also prematurely impact the skin’s ability to cope effectively. 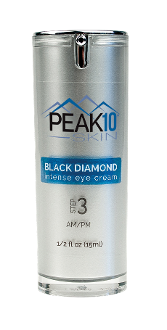 PEAK 10 SKIN’s BLACK DIAMOND intense eye cream is the support your skin requires to whip the alignment process back into action, and motivate tighter and firmer skin around the eyes. This eye cream impacts the skin’s natural lifting properties, by reorganizing the dermal architecture, rapidly enhancing skin density and firmness. This leads to a reduction in roughness and fades out wrinkles for a healthier skin appearance. To optimize moisture and ensure a comfortable application, we’ve added a blend of two organic rehydrating oils from Palm trees. Remove all makeup and clean your face completely. Apply to ring finger and tap gently over the entire eye area. Purified Water (Aqua), Simmondsia Chinensis (Jojoba) Seed Oil, Squalane, Candelilla/Jojoba/Rice Bran Polyglyceryl-3 Esters, Glyceryl Stearate, Cetearyl Alcohol, Spilanthes Acmella Flower Extract, Sodium Stearoyl Lactylate, Glycerin, Cetyl Alcohol, Hydrogenated Palm Kernel Glycerides, Hydrogenated Palm Glycerides, Hydroxypropyl Starch, Caprylic/Capric Triglyceride, Phenoxyethanol, Ethylhexylglycerin, Xanthan Gum.